LONDON • Paul Pogba aimed a thinly veiled dig at Jose Mourinho by claiming that he and his Manchester United teammates are playing in the way that they want to since the Portuguese was replaced by Ole Gunnar Solskjaer. The France midfielder, who was dropped after a series of run-ins with Mourinho, has scored four times, including a brace in the 4-1 win over Bournemouth on Sunday, in the three Premier League games under Solskjaer. The World Cup winner suggested that the interim appointment had given the United squad a new lease of life, claiming the players were playing in an attacking way that they enjoy, which was not the case under the Portuguese. "It's different," the 25-year-old Pogba, who became the first United player to score at least twice in consecutive league games since Wayne Rooney in 2012, said. "We still won some games with the old manager, it's just a different style of play. We are more offensive, we create more chances and play higher. "This is how we want to play, we want to attack. The manager wants to attack. And that's what we are doing on the pitch." It took less than four minutes for Old Trafford to be sure that the Solskjaer honeymoon was still in full swing. Marcus Rashford took the ball out near the touchline and there was seemingly nowhere for him to go with his back to goal. But he, too, is revitalised. For his first trick, he turned sharply, slipping the ball one side of Nathan Ake and running around the other; for his second, pulling off an "elastico" that Ronaldinho would have been proud of to dart past a flummoxed Diego Rico. Freed to play as a No. 10, Pogba was waiting to meet Rashford's low cross with a sliding finish. It was the second time in three games that United had scored in the first five minutes; they had managed it just twice in the previous 25. The handbrake is off. Bournemouth had a back five hoping to keep things tight, but they had no answer to the dominant hosts' swashbuckling style, going two down in 33 minutes after Pogba equalled his best tally of nine in one season for the club. Rashford made it three before Ake pulled one back for the Cherries in first-half added time. Pogba also felt the Red Devils have rediscovered their ambition and a winning mentality after beating Cardiff, Huddersfield and Bournemouth during Solskjaer's brief time in charge. He said: "It was a great performance as well so we're coming back. There is still a long way to go, but to finish the year like that is beautiful. "Maybe we have just realised that we are Manchester United and we need to be at the top of the league. You've seen the reaction of the players. Everyone is enjoying themselves and that's what we need." He was denied his hat-trick by Asmir Begovic's fingertips before substitute Romelu Lukaku netted United's fourth, while Eric Bailly was sent off for senselessly scything down Ryan Fraser for the only blemish of the game. 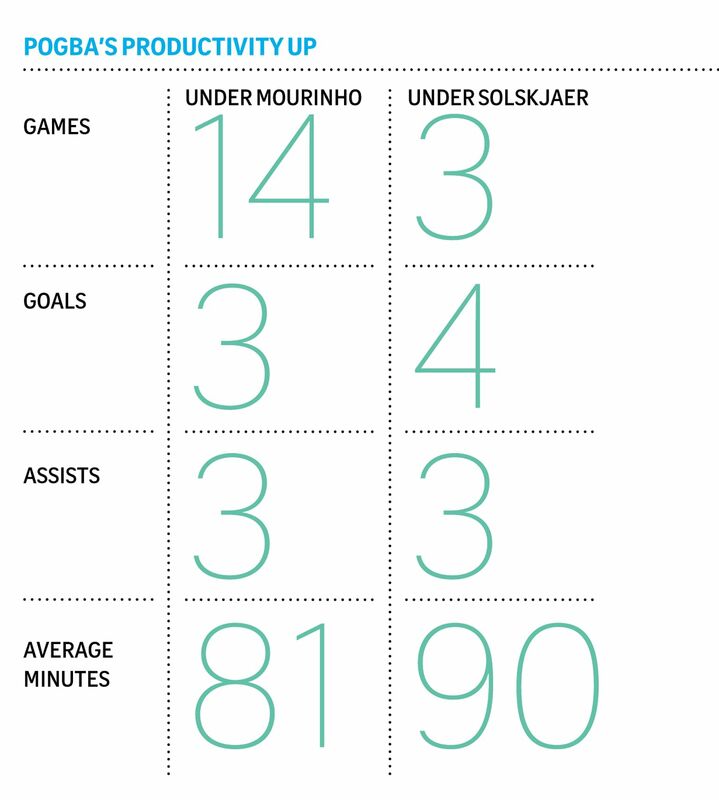 Solskjaer was delighted with the £89 million (S$154.1 million) club-record signing's display and challenged Pogba to maintain his consistency ahead of tomorrow's league trip to Newcastle. "That is a top performance from a midfielder because it's all-round, it's work rate, it's dangerous," the United caretaker manager said. "He plays the efficient game and Paul knows he's at his best when he plays that game. "It is the same I have said to all the players - we want to see the best out of them, enjoying themselves, expressing themselves, within the framework of how we want to see the team play. All of them have really performed up to top standards."